I came across a colour ringed female Ringed Plover out on Omey Strand yesterday. I've had a few colour Ringed Plover here and at other local spots in recent years from England, Scotland, Germany, Iceland and Norway. I was expecting it come one of these locations. I could also see that the bird was carrying a geolocator on its left tibia. It's amazing how small these devices have become in recent years. The only drawback with these are that the bird has to recaptured for the data to be downloaded. They also don't tend to be as accurate as satellite transmitters but maybe that has been also improved? Hopefully if this bird is recaptured next summer we'll see how accurate it actually is. 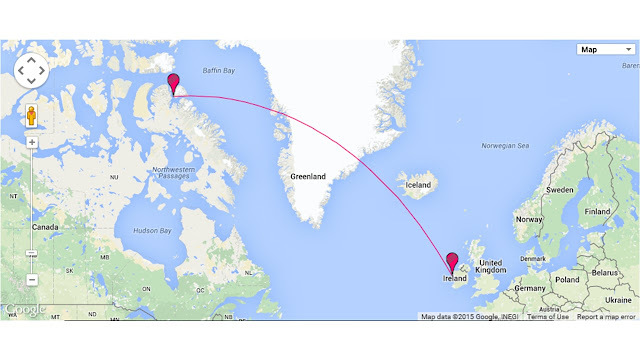 There's a single record of a Ringed Plover being ringed at Collister Pill, near Newport, Gwent, Wales on 19th May 1973 which was recovered dead in Sverdrup Pass, Ellesmere Island, Canada on 13th July 1979 having been found recently shot there. There are appear to be no other Canadian Ringed Plover movements recorded by the British Trust of Ornithological who also run the Irish ringing scheme. However two birds from this same colour ringing scheme were discovered in the UK last year. Details of one in the links below. I got the following mail from Don-Jean Léandri-Breton today. This is very exciting! Thank you very much for reporting this observation. Any resights gives us helpful information about the birds behaviour and habitat use. The location you sent me gives us the opportunity to do a calibration of the logger during the migration which increase location accuracy. So, your re-observation of this bird makes it the most wanted plover for next year field season! I'll let you know if we succeed. This plover is a female captured for the first time in 2014 on Bylot Island, Nunavut (see details attached). This year we caught it back and retrieved the geolocator. I didn't see the datas yet cause the logger battery was dead, I need to send it to the company so they will download the datas for me. But I can tell you that the loggers we downloaded from other plovers indicate that they migrate from the Canadian Arctic down to Western Africa (coastal Mauritania, Senegal...) with stops along the way in Southern Greenland, Ireland, UK, France, Portugal and Morocco. The spring migration is similar. Along with the location, date and time, the pictures you took already gave me most of the information I need for this resight: the bird was feeding on a mudflat/beach during low tide in a large loose group of Ringed Plovers. If you noticed any unusual details about its behaviour, health, etc. please let me know. Thank you to keep me up to date if you see the bird again and to let me know when you assume the bird has left this site. Here some photos of this bird during the banding and of its nesting habitat along the Camp 2 River. Don-Jean Léandri-Breton, B. Sc. A. She was first captured on 27th June 2014 and again on 23rd June 2015 when the 2014 geolocator was retrieved and a new one was attached. So fingers crossed Don-Jean will be able to recapture her again next summer to download her data. Its likely that she may well continue moving on further south to west Africa so she could be only just over half way to her final destination. I wonder if she passed through this area in 2014 and if she returns north again via Omey in the spring. Canadian colour ringed Ringed Plover, Omey Strand. Canadian colour ringed Ringed Plover, Omey Strand. Playing tug-of -war with a marine worm. Bylot Island to Omey Island, 3783km as the Ringed Plover flies. Bird in the hand as it was being ringed, photo by Don-Jean Léandri-Breton. Close up shot of the geolocator, photo by Don-Jean Léandri-Breton. 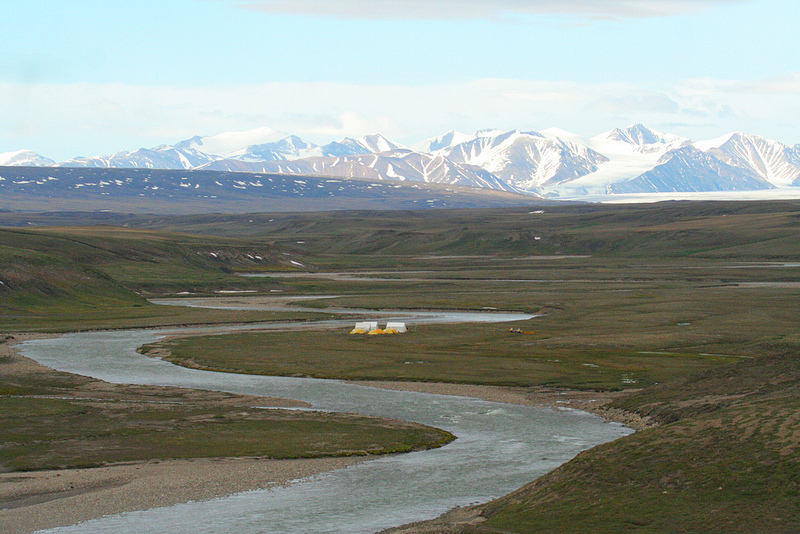 Bylot Island, she nested beside this river with the researchers camp in the background, photo by Don-Jean Léandri-Breton. Amazing story, Dermot. Never thought 'our' Ringed Plovers travelled to Arctic Canada.